The explosion of online mockery over Mitt Romney’s binder comment at the debate reveals a bigger problem. Mitt Romney did not just lose the debate on Tuesday night. He handed the Internet ammunition to memorably mock him for several more news cycles. While candidates have always worried about gaffes, this year’s nominees must navigate the first Meme Election. Romney is particularly vulnerable because his malapropisms sound more awkward than stupid. Take the instantly infamous binder discussion at the second debate. Asked about “pay equity for women,” Romney said that women’s groups brought him “binders full of women” to help identify candidates for his cabinet. The Internet went nuts. People seized on the comment immediately—and it did not simply “go viral.” When 70 million people have already watched something happen live, you can’t just share a clip of the moment. Instead, Romney’s phrasing sparked an explosion of what techies call voter-generated content. Before the debate even ended, a flurry of humorous and scathing binder websites, Twitter accounts, and Facebook groups cropped up online. 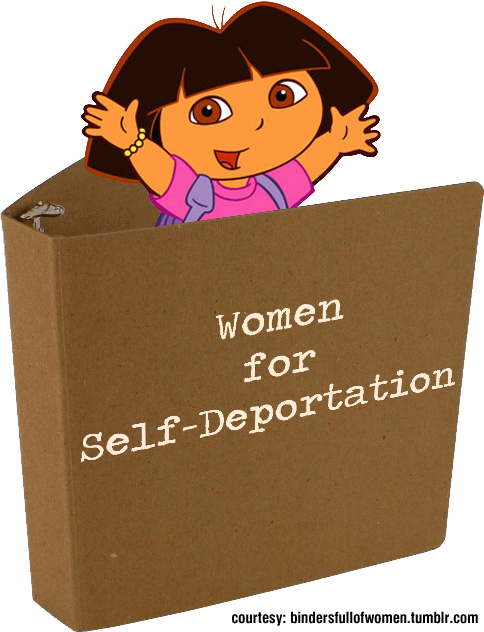 On the photo-blogging site Tumblr, an irreverent string of pictures remixed the literal image of women, stuffed into binders, with other pop cultural memes—from Dirty Dancing (“No one puts baby in a binder”) to the cartoon character Dora The Explorer (“Women for Self-Deportation”). The Tumblr site curating the images was created by Veronica De Souza, a self-described “social media pro” in Brooklyn who says she is looking for work. All that creative, clickable content provides another way for regular people to define the debate’s big moments, competing with a role once reserved to the professional press. This is not Romney’s first experience on the wrong side of a popular meme, of course. To take another influential example, consider this punishing Internet statistic for the GOP nominee. The most popular online video featuring Mitt Romney is the clip of his infamous “47 percent” remarks. The footage has drawn over 5.2 million views on YouTube—more than triple the views for the most popular video that the Romney campaign ever made. The political establishment was more interested in the issue, compared to the binder gaffe, but they damaged Romney in part because they took root so easily online. While many of Romney’s most visible scars this year were undeniably self-inflicted, the social media environment can also be unfairly harsh on certain kinds of mistakes. All the binder glee actually demonstrates that dynamic. Unlike the “47 percent” comments, which put a cruel gloss on an economic plan that already hurt the most vulnerable citizens, or Clint Eastwood, who used a party platform to denigrate a sitting president in unusual and embarrassing terms, Romney’s “binder” line alluded to a legitimate idea. He was touting efforts to proactively recruit qualified women candidates. He cited a study concluding that his administration led the country for appointing “women in senior leadership positions.” (True, from data based on his first year in office). Basically, Romney was addressing a pay parity question by touting a type of affirmative action. The binders were not the problem. The real hypocrisy is that while Romney sought credit for the results, as governor, he actually signed an executive order banning equal opportunity programs for women in 2003. Then, after a backlash, he reverted to the original policies, which helped advance women and minorities throughout state government. This is not simply some state government history, either. Just this month, the Supreme Court heard arguments about banning affirmative action across the country. Romney refuses to state any position on that case, despite repeated press inquiries, while Obama has endorsed affirmative action (and defended it in the court case). Ultimately, Romney is getting sassed for how he talked about the binders, because it was just too perfect. But his bigger problem is that on this issue, like so many others, Romney will say just about anything as long as it doesn’t involve taking a firm position. For more on Romney’s “binders full of women,” read Bryce Covert’s latest.